RRP: £25.00, US $34.99, Cdn $45.99? 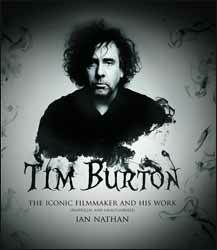 For an "unofficial and unauthorised" book, Tim Burton: The Iconic Filmmaker and his Work has all the hallmarks of an official publication. It has film stills by the bucket full, normally something not expected with unofficial books. Likewise, Ian Nathan isn't your fan boy author. He's been a film writer, producer, broadcaster and magazine editor for twenty years. As executive editor of Empire, film magazine, he has had the immense good fortune of traversing the globe, interviewing the great and good: watching the godlike Steven Spielberg at work, buying Sigourney Weaver breakfast and eating ice cream with Peter Jackson and a table full of orcs. He has regularly contributed to books; newspapers such as the London Times and Independent; and magazines; had a weekly radio show; and produced TV documentaries and award ceremonies. So right from the start you know you're getting something a little special here. And to add their touch, Aurum Press add even more value by publishing this on full colour, high quality paper with a hardback, rounded off with a hardcover slipcase which has a slight metallic finish to it. So, what of the contents? To be perfectly honest, in this day and age, thanks to the Internet there's pretty much nothing here that can't be unearthed through Google. But, what it does offer the reader is a well illustrated run through Burton's wild and wacky career, starting from this youth and then charting, in some detail, every movie he's directed. There's even a handy pull out timeline of Burton's involvement in the industry as writer, director and producer. The book contains 178 pages, with chapters that analyse the success and style of films such as Beetlejuice, Ed Wood and Mars Attacks!, and examine how Burton breathed new life into well-known stories that include Batman, Planet of the Apes and Charlie and the Chocolate Factory. Finally, the book looks towards the future and his upcoming films Alice Through the Looking Glass, Miss Peregrine’s Home for Peculiar Children, and Beetlejuice 2. It's a lovingly crafted publication that will take pride of place on any Burton fan's bookshelf.